Dredging trout in flour and frying has a kind of folksy fishing-trip-campsite feel about it, but the beurre blanc sauce gives it a touch of refinement. Prepare the fillets. Trout can be very tricky to fillet. Ask your fishmonger to do it for you, or buy the trout filleted, or fillet them yourself. You can also ask the fishmonger to take out the pin bones. These are bones in the thickest part of the fillet which travel (from the now removed backbone) through the flesh at about a 30 degree angle up toward the top of what would have been the fish. They extend from the head end about halfway down the fillet – you can feel the bones with your fingers. Either remove these with fish tweezers or cut out a sliver either side of the bones. You can see where I have cut out the bones in the bottom fillet in the photograph. Cut the fillets into sections to make it easier turn in the frying pan. Set the fillet aside and make the sauce. Make the sauce. Slice the shallot and put it into a sauce pan. Add the wine, peppercorns and tarragon. Bring to the boil and flame to burn off the alcohol. Add 200ml of water and bring back to the boil – simmer until reduced to about 250ml of liquid. Strain the sauce into another pan and add 1 rounded tsp of cornflour mixed in 1 tablespoon of water. Whisk and bring back to a simmer to thicken (this starch helps to stabilise the sauce and avoids the need to rely on huge amounts of butter to make an emulsion). Add the creme fraiche and take off the heat. Add the butter and continue to whisk into a thick sauce. Add lemon juice and salt to taste – it may need more than you think of both. Fry the fish. Dredge the fillets in flour. Heat a large frying pan on medium-high heat and add about 25 of butter and an equivalent of oil. Add the fillets skin side down and fry, gently turn the fillets over and fry until lightly browned. Turn over once more and serve with a slotted spatula to drain excess oil and butter. Plate the fish. 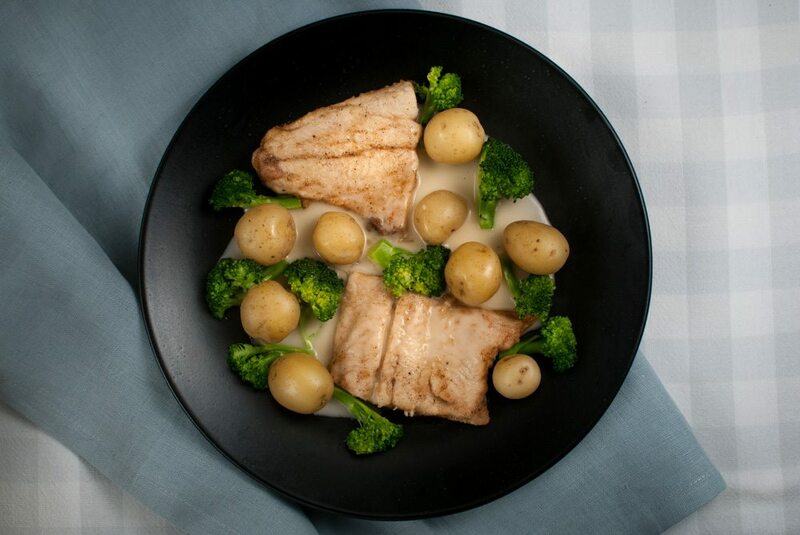 Serve the fish with potatoes, broccoli and the sauce.